It was our worst day on the battlefield ever, even worse than the blunders of Gallipoli. On the 12th October 1917, near Ypres in Belgium, 1084 New Zealand soldiers either died or received deadly wounds. As October went on the number of dead reached 3700. Each year on Anzac Day we remember the many who died at Gallipoli, but do we remember those who fought and died at Passchendale which included the 1905 "Originals" captain Dave Gallaher? 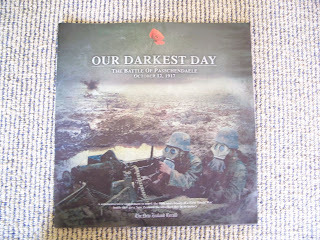 The 90th anniversary of the battle will be held in two days time. It is a day were we can remember all those who fought so that we could live in the freedom we enjoy today. You might have seen the supplement (pictured) in the Herald a little while ago. If you have it still you might like to spend a few moments having a look at it.